There are a lot of moving parts in an online marketing strategy. You’ll need great content, a clean and responsive web design, and a strong social media game. Threaded throughout almost everything you do is your SEO/SEM strategy, which helps you get your site out in front of potential users. But how do you do that, exactly? And what does those acronyms mean? Search Engine Optimization – SEO. SEO is concerned with organic search – getting people to find your website when they need it. A lot of this involves keywords: the phrases and words that people would use when they’re searching for a product. A good SEO strategy will increase the number of people who find your site, as well as improve the quality of those leads. If you sell farm supplies, your SEO strategy will be geared towards people who want to buy farm supplies. Search Engine Marketing – SEM. SEM is all about paid advertising, like pay-per-click (PPC), in combination with organic, unpaid traffic. If SEO helps you sell farm supplies to the entire internet, SEM targets farmers in your geographic area looking to buy, say, the types of tractors your company produces. Social Media Marketing – SMM. Social media keeps you relevant and engaged. The SMM strategy can help you sell your farm supplies to people who didn’t know your company existed before, or who didn’t realize they needed those supplies in the first place. Your clients are more likely to share your links and your site via social media with others who might want to engage with you. All of these elements work together to ensure that once clients find you, they want to stay on your site and explore what you have to say. It’s really tempting to just handle your SEO/SEM strategy on your own, we know. After all, you know what a keyword is, and you know how to put an ad on Facebook, and that’s all there is, right? See, the rules of engagement when it comes to search can change in an instant, and before you know it, Bam! Your site has dropped off the map. It’s better to get a team who can monitor your site, adjust as necessary, and create a strategy to roll out after the next big algorithm change comes along. And then there are the links. And the title tags. And the coding errors that can pop up if an outside link is taken down. 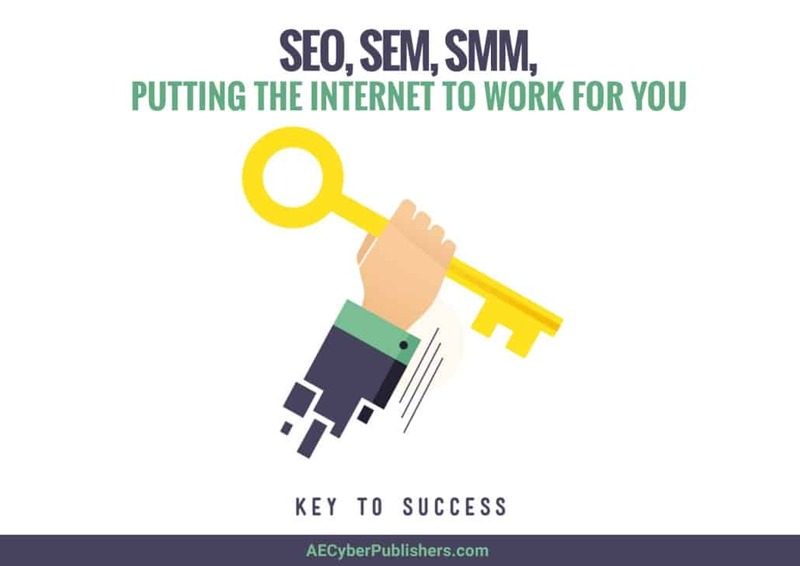 Just like you wouldn’t hire an accountant to redo the plumbing in your bathroom, you don’t want to handle your SEO/SEM strategy on your own. Simply plugging in keywords won’t work anymore, because the market is too competitive. You want a team of experts who can adapt your search strategies to the ever-changing needs of your users. A&E Cyber Publishers creates SEO/SEM strategies designed with your unique goals in mind. From the creation of your website to the management of your social media accounts, three’s nothing we can’t do. If you’re ready to start attracting quality leads that convert into real clients, we’re ready to help. Please call 201.923.9938, or fill out our contact form, and get started today.